Come to lounge amidst the privacy of Turtle Cove, stroll mile-long Meads Bay Beach, or take in Anguilla’s rich culinary scene, where you’ll find dynamic flavors everywhere from tiki-style beach shacks to our signature restaurant. You’ll feel at home with our easy island lifestyle —and with the Malliouhana family. Sit atop a sailboat while watching the mesmerizing crystal clear water splash around you, Malliouhana is an island with numerous activities for any traveler. The island is home to outstanding Anguilla activities including snorkeling, sailing, scuba diving, kayaking, and paddleboarding. Savor creatively prepared dishes with the freshest of local flavors at the resort’s signature Anguilla restaurant. Or watch the sun go down with a drink in hand from the most scenic vantage point on the island – the Sunset Bar. Find one of the many secluded places on the resort to enjoy the company of a loved one in the sunshine. Relax, restore and rejuvenate with a sweet sugar cane body exfoliation finished with a coconut creme massage or feel your tensions melt away under naturally warmed sea shells filled with lava and saltwater. Our state-of-the-art fitness facilities are supplemented by complimentary fitness classes, which draw on a combination of disciplines and techniques and cater to all experience levels. 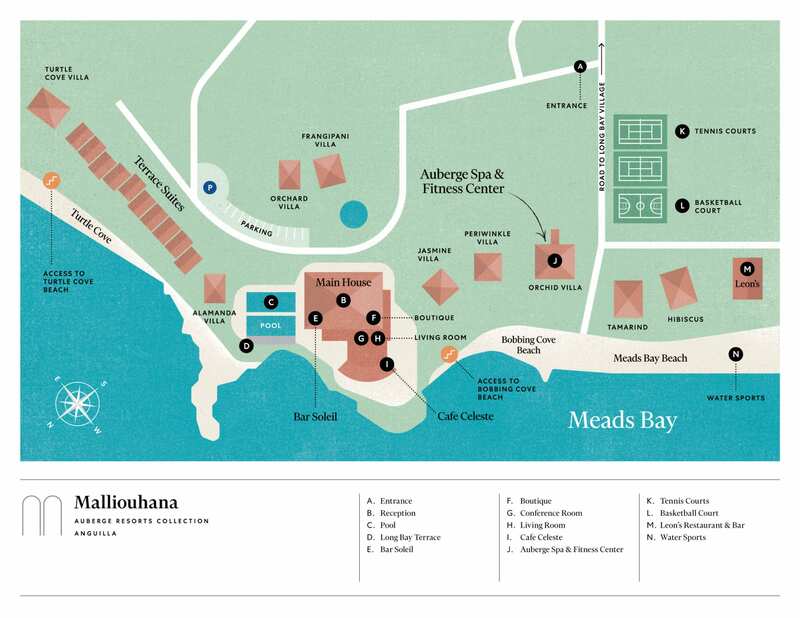 Apart from offering gorgeous ocean views, Malliouhana’s meeting venues in Anguilla are complimented by a professional conference services staff to assist with the coordination of every detail of your entire event. Decorated in a bright, contemporary Caribbean aesthetic, these guestrooms are well lighted and full of interesting decor to delight your senses. Suites feature either one or two queen beds made for spacious living, each fixture of the room has been placed in perfect harmony and design with island life. These accommodations offer either garden or ocean views that's sure to please the eyes. From snorkeling along pristine coral reefs and sunken ships, to exploring a celebrated culinary scene noted as much for its casual beach shacks as its stylish fine-dining restaurants, the unrivalled pleasures of Anguilla await.